Imagine visiting Ghana, the West African country located in the center of the earth, while you are at it, continue imagining that your travel arrangements are all taken care of from transportation to accommodation to the provision of tour-guide services and more. Now open your eyes and think Ghanam Tours. Yes, no need to go on imagining because Ghanam Tours make all the above a reality, oh and more. Ghanam Tours is located on 6911 Richmond Highway Suite 324 in Alexandria Virginia, USA. So a little about what Ghanam Tours is all about: first of all they are a tour agency made of a group of passionate and knowledgeable individuals that are dedicated to making your visit to Ghana a memorable and educational experience. Engage with them and they will bring the history and culture of Ghana to you in a way that leaves you excited and relaxed. Here is how they do it at Ghanam Tours; their travel packages are designed to save you the time of trying to navigate such a tour on your own. Additionally, they specifically design such packages with you in mind, in effect, all group trips are customized to the specifications of respective groups. For instance, a small group tour will be designed in such a way that ensures the group gets the one-on-one attention it needs in order to enjoy their home-away-from-home atmosphere even though they are miles away from home. You get that special treatment right from the get-go with Ghanam taking care of your travel needs once you board the flight from the United States and arrive in Accra, Ghana. It definitely does not end on your arrival in Ghana because that’s when it begins to get even better. How do you ask? Well, Ghanam Tours will be with you all the way from the airport to your hotel and throughout your tour and stay in Ghana. While in Ghana you will experience what it means when a Ghanaian says ‘Akwaaba’, which is the Akan language version of ‘Welcome’! You will also experience the proverbial Ghanaian hospitality thanks to all the care and attention provided by Ghanam Tours just to put you in your relax-and-enjoy-it mode while you travel the country located in the center of the world. Read other tourism/travel related pieces in this link. Explore and appreciate African American history and heritage as you tour historical and cultural sites along the coastal towns and cities of Ghana or travel to the hinterlands of the country and simply get to explore historic places like the capital city of Accra, the coastal cities of Cape Coast and Elmina which were epicenters for the trans Atlantic slave trade. Or check out the garden city of Kumasi which houses the great and rich cultures of the Ashanti Kingdom or venture out up north and have a feel of the ’crocodile pond’ of Paga in the Upper East region of northern Ghana. These are just a tip of the iceberg of all the fun places you can check out. Your tour to Ghana, whether it be with a small group of 10 or a larger group will really be one of your most memorable vacations if not the best as you visit amazing sites in Ghana. Tour packages always include hustle free Ghana Visa acquisition, airline ticket booking, travel insurance, hotel accommodation, ground transportation and yes breakfast and dinner every day that features favorite Ghanaian cuisine with extra room for international cuisines or foods that work best for your group’s palette. 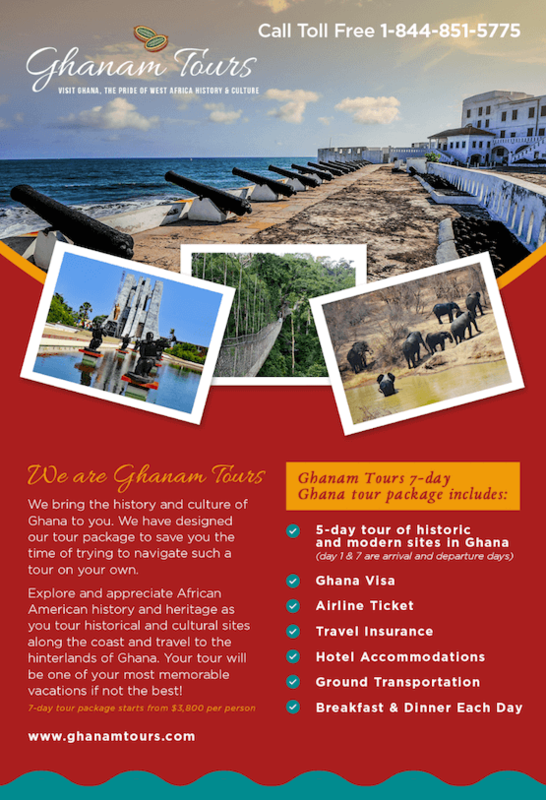 If it must be said, then be informed that expert members of the Ghanam Tours team born and raised in Ghana with extensive knowledge of the sites you will be visiting also speak the language of the area. They will guard and guide you on your tour so nothing will be lost in translation. You will do more than just see a place; you will live the experience in all imaginable ways. Are you curious now, visit the official Ghanam Tours website at www.ghanamtours.com for more information or contact them on phone +1844-851-5775. Their email address is info@GhanamTours.com and tell them Oral Ofori of TheAfricanDreamLLC sent you. Next GhanaPostGPS The Cost Analysis Paying Google Maps $400k a year?